Mrs. Detter’s first grade class at Eshleman Elementary and Mrs. Letavic’s high school ELL (English Language Learner) buddies celebrated the Chinese New Year on February 8. The first grade students decorated their classroom with Chinese lanterns and heard a story about a child in China celebrating the New Year. The first grade students received traditional red envelopes containing “money” and a Chinese calendar to color. The calendar is based on the legend that in ancient times, Buddha asked all the animals to meet him on Chinese New Year. Twelve came, and Buddha named a year after each one. He announced that the people born in each animal’s year would have some of that animal’s personality. This year is the year of the snake. For a treat, all the students dined on sticky rice, oranges slices, and fortune cookies. 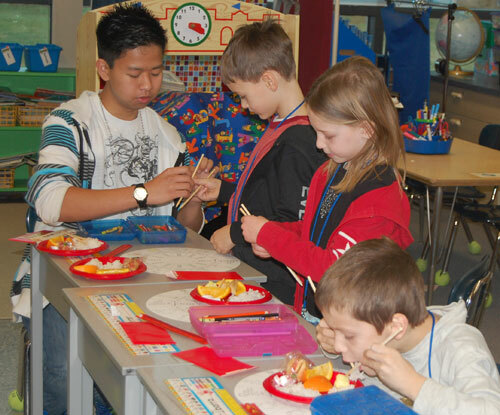 The high school ELL students taught the first grade students who to use chopsticks.